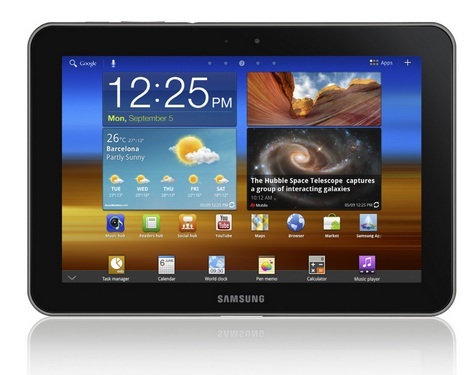 Samsung Galaxy Tab 8.9 is a 4G Tablet that was unveiled by Samsung at IFA 2011. This Tablet PC is supporting the 4G LTE network so you will be able to enjoy fast speed communication and browsing through such device. It comes with a touch screen display and Android 2.3 Gingerbread so you are able to get the maximum from this Android Tab. You are able to access Samsung and Google Mobile services through it. For connectivity it not only offers fastest 4G LTE support but also HSPA+ 42Mbps, WiFi and Bluetooth 3.0 capabilities. Have a look at full specs of Samsung Galaxy Tab 8.9 4G LTE Tablet. Display: An 8.9-inch large, and which can deliver a 1280 x 800 pixels resolution. Samsung Services: Social Hub, Music Hub, and Readers Hub, Samsung Apps portal.